Final Standings for Lafayette Pinball League! 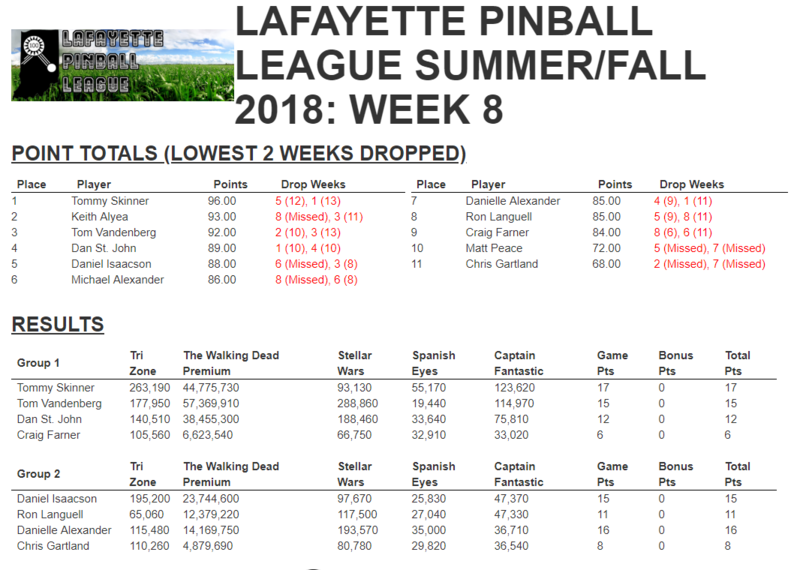 Here are your final standings for the Lafayette Pinball Summer/Fall League Season! Our finals event will be in two weeks. My suggestion is that we alter the format from tradition and simply make it a group strikes tournament to increase its value, I will send out a survey soon. A reminder that next week is the monthly tournament at Main Street Amusements on Tuesday evening at 7:30 PM. I will not be able to attend as I will be out of town for my fall break so anyone who is willing to help run the event please let me know. I can get you completely set up, just can’t physically be there that night.